Devcon is the most important event of the year. It’s where Blockchain’s smartest developers and entrepreneurs get together under one roof to chew the Blockchain fat and make stuff happen. This year saw over 3000 people travel to the picturesque, crypto-friendly city of Prague and needless to say, we were thrilled to get involved. First things first - stickers. 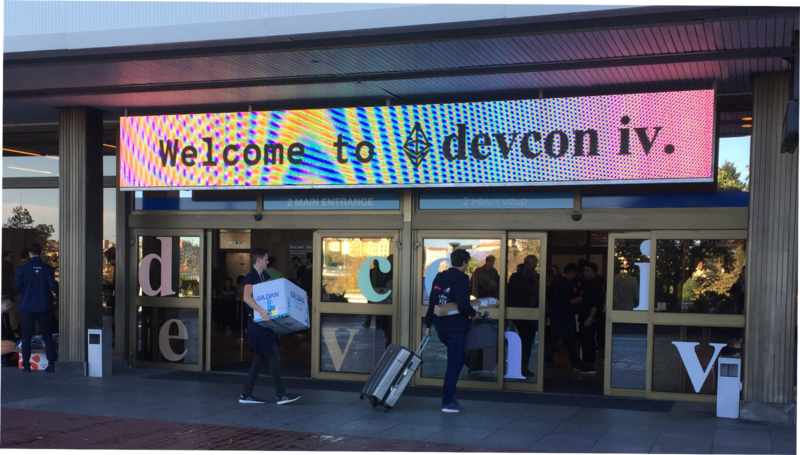 If there’s one word that captures the essence of Devcon4 it’s BUIDL. Projects across the spectrum came together to showcase what they have built, and are building, surrounding key areas of scalability & performance, user experience and social responsibility. Below we spotlight just some of the projects and developments harvested, wrapping up with some shots of what else we got up to Prague. “Really not so far away” Buterin. As we all know, the pressing questions of scalability and performance have been confronting the Ethereum community for some time. In his keynote speech, Vitalik Buterin highlighted the work The Ethereum Foundation has been doing to solve this over the past 4 years, such as trialing a number of new models — Hub and Spoke chains, Hypercubes and various Proof of Stake models — ultimately leading to the evolution of Casper, Sharding, eWASM and many other key touchstones that constitute Serenity. “Ethereum 2.0 is […] a combination of a bunch of different features that we’ve been talking about for several years, researching for several years, actively building for several years that are finally about to come together in one cohesive whole,” Buterin. Serenity comprises the benefits of Proof of Stake (Casper) and sharding in one protocol. Instead of developing each in parallel, leaving the issue of merging to the future, both will be developed in tandem, establishing the properties needed for reliable performance and scalability. Coupled with this is the addition of Ethereum-flavoured WebAssembly (eWASM) — a subset of WebAssembly, designed specifically for Ethereum contracts and consensus computing. It is set to replace EVM, the current Ethereum Virtual Machine, making for higher speed, efficiency and security. The Ethereum Foundation has been hard at work researching, experimenting and developing new components for the improvement of the Ethereum ecosystem. And we found it reassuring that whilst it will likely be a while before Serenity is fully implemented, the foundation is responsibly focused on creating a solution that is reliable and stable. Side-chains — A prominent topic at Devcon, Layer 2 allows transactions to be executed off the mainnet, ultimately making it less congested. Karl Floersch spoke about the instrumental Plasma Side-chains and discussed their use-cases and future on the Ethereum blockchain. Zero-knowledge proof — Privacy is important for many users of blockchain technology, making the question of data protection essential. Protocols such as zk-SNARKS, make it possible to keep transactions confidential on a blockchain that is by nature fully transparent. Metamask — Announced they will be rolling out their new mobile browser for early 2019. Meaning those of us seeking to access our wallets and make transactions from the convenience of our smartphones will be able to do so. ConsenSys — Launched Rimble, an open-source project that aims to establish clear design standards in the Ethereum ecosystem, providing useful frameworks and solving problematic issues surrounding UX. Ethereum Name Service— Is a domain name service that gives a human-friendly name to your Ethereum/dApp address, making it easier to read and identify. The team behind ENS announced the introduction of two new ‘top level domains’ — .xyz and .luxe with more in the pipeline. Universal Ethereum Logins— UELs make it possible for blockchain technology to interact with web2 browsers and by using a proxy that stands between apps and dApps, users don’t need to think about private keys or seed phrases, making for easier accessibility. UELs additionally simplify things by allowing the same log in to be used across multiple apps. The congress centre was carved up into a labyrinth of rooms all hosting various speakers, discussions and workshops. Just as important as UX is… DX. 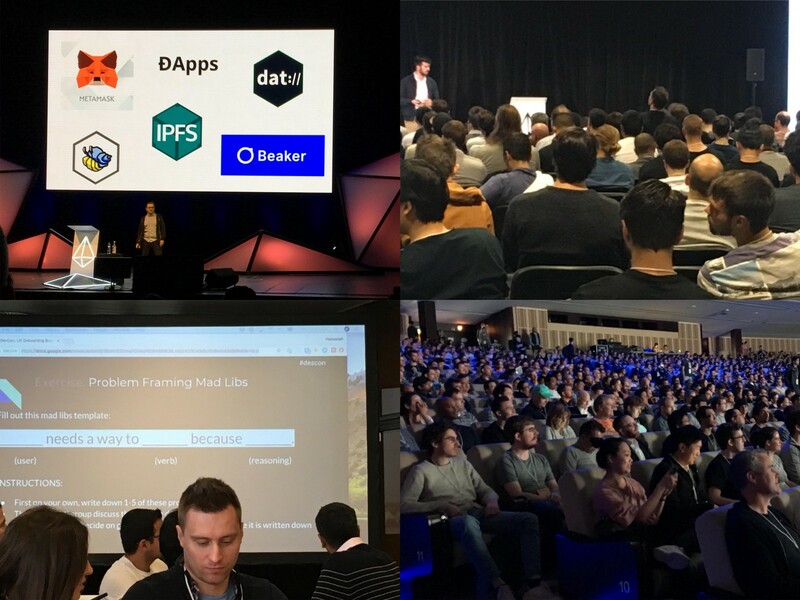 Here is a list of exciting projects we saw at Devcon who are building valuable developer tools for experimentation and learning, making for a smoother journey into the vast world of blockchain development. Embark — ‘Embark Into The Ether: Aiming For Pluto’ workshop showed how to create dApps in a ‘serverless’ environment and how simple it can be to create decentralised applications on Ethereum. Yul — Is an Intermediate, middle-ground Language for Ethereum that provides portability across multiple platforms. ETHPM — A registry of reusable smart-contract packages for Ethereum. Dapparatus — Provides reusable dApp components in React in a handy NPM package. E.g. contract loader, metamask, gas, transaction ui, event parers, and more. Blockchain technology offers us ample opportunity to experiment with new systems and processes that can change our world for the better. Nowhere is this forward-thinking spirit captured better than within the Ethereum community of developers. We were inspired to hear some of the talks and learn about some of the projects coming out of this unique environment. Lane Rettig — Towards a Socially Scalable Etherean future. Rettig announced the launch of new forum Etherean.org, dedicated to discussion around the positive social, political and economical effects of blockchain systems. Cory Doctorow — Decentralize, Democratize or Die. Doctorow speaks to the importance of pluralistic states and ensuring we create blockchain systems that fundamentally support decentralised governance models. 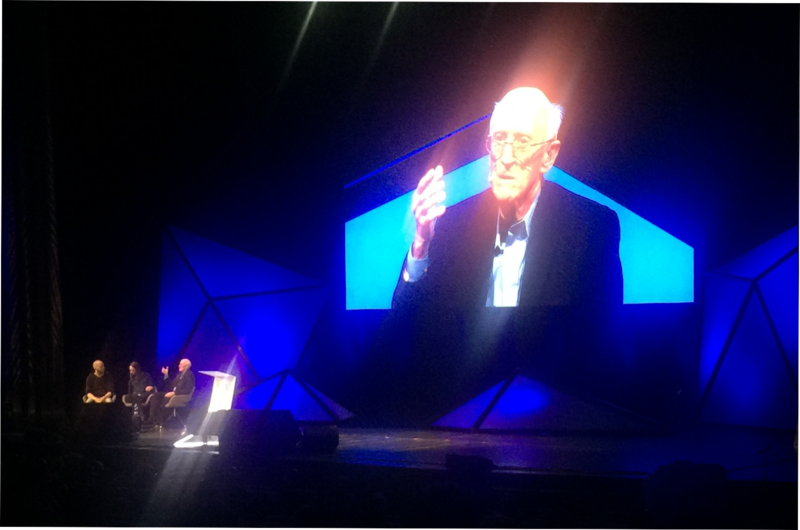 Stewart Brand — Closing Devcon4 was a panel discussion with life-long hacker and author Stewart Brand who coined the phrase ‘information wants to be free’ and emphasises the importance of ethical hacking and creating technology around social responsibilities. “The customer of Ethereum is Civilisation” Stewart Brand. Sadly, whilst we did attend other events, we were advised by Legal to destroy all images… So you’ll have to take our word for it! That being said, a big shout out goes to Chainlink, Rockaway, CBC Casper and others for hosting amazing parties. We also organised a free breakfast networking event, where we met some great projects; Totle, Maecenas, Rightmesh, Workinblockchain to name just a few. All whilst enjoying a healthy start to the day and getting in the mood for Devcon. For future events like this, make sure you check out and join our group here. Witnessing the positive and constructive energy at Devcon4 was inspiring. We took part in workshops and enjoyed discussions that will positively impact the shape of Ethfinex in the fast approaching future. Thank you to The Ethereum Foundation for the immaculate organisation and superb curation.